Cloud is the my first bird since childhood, and now that my own children are both old enough to allow it, I intend to have many more. His temperament is alot like his coloring - like the sky on a beautiful spring day. breezy and warm. 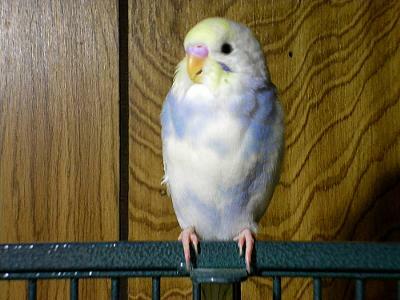 This is an Danish pied boy budgie :) it Will never turn Blue on The cere. It Will Stay This colour. In these photos Cloud looks like a young boy to me. 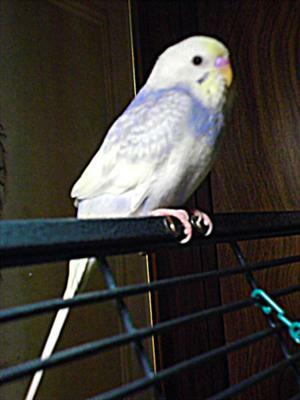 An adult male has an even blue cere but a youngster starts out with an even translucent looking pink one. Young hens have a bluish cere with white around the nostrils and it eventually goes brown as an adult but will change between these colours as her hormones cycle. Um, I think your bird is a female. The cere is a light pink. Male's have a dark/light blue. This budgie is so adorable! And I love it's amazing pattern of colour. It is very beautiful too.